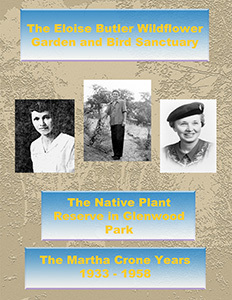 The Native Plant Reserve - Martha Crone Years. 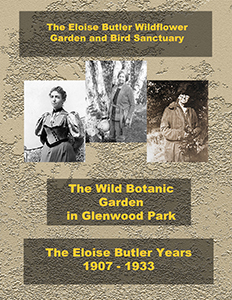 The Wild Botanic Garden is a companion volume to Martha Hellander's biography of Eloise Butler - The Wild Gardener. It provides a detailed narrative of each year of Eloise Butler's tenure as Curator - 1907-1933. 294 pages. historical photos, documents, all the known correspondence between Eloise Butler and Martha Crone, plus index. If printed double sided, it is in book format - 8-1/2 x 11 size pages. This file will view correctly in Adobe Reader or similar program. Downloadable low resolution PDF file - good for screen viewing. A larger higher resolution file is available for better print quality. Text by Gary Bebeau. 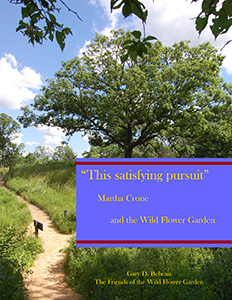 This Satisfying Pursuit is a book-length sketch of the Garden's second curator and founding member of The Friends of the Wild Flower Garden. 176 pages, historical photos, documents, all the known correspondence between Eloise Butler and Martha Crone, plus index. If printed double sided, it is in book format - 8-1/2 x 11 size pages. This file will view correctly in Adobe Reader or similar program. Downloadable low resolution PDF file - good for screen viewing. A larger higher resolution file is available for better print quality. Text by Gary Bebeau. The Native Plant Reserve is a companion volume to This Satisfying Pursuit. It provides a detailed narrative of each year of Martha Crone's Curator years - 1933-1958, which are only summarized in the previous book. 266 pages, historical photos and documents. PDF format, 8-1/2 x 11 inches - in book format if printed double sided. Text by Gary Bebeau.